The diverse careers enjoyed by graduates of The Art Effect illustrate the rather surprising effect of nurturing artistic abilities. Graduates of the Poughkeepsie-based, non-profit, arts education program currently work in animation, teach art, design stores and museums, and work as illustrators and photographers in film production and textile design. Poteet and Art Effect’s development director Anna Langdell have plenty of success stories to share. One of Langdell’s favorites was a shy girl who first attended the program at 13 and preferred to sit in the back of the class. Now she’s confident enough to teach an after-school arts program in the Poughkeepsie School District. “We were always trying to draw her out of her shell,” says Langdell. “When she started making films she also had to act in her own films. So, she learned how to find her voice and have more presence. As a teenager she stayed with the program, worked her way through to the upper level courses, then went on to college. Now she’s come back to Poughkeepsie. She’s running a film cooperative and is a teaching artist in the Poughkeepsie schools. She’s come full circle.” Although the Art Effect has technically only existed since January 1 of this year, it’s a merger of two long standing, Poughkeepsie arts programs, Mill Street Loft and Spark Media Project, which both helped students learn art and life skills. Art Effect programs currently enroll about 400 students in Red Hook, Millbrook, and Poughkeepsie summer camps and between 700 and 800 students in various programs throughout the year. 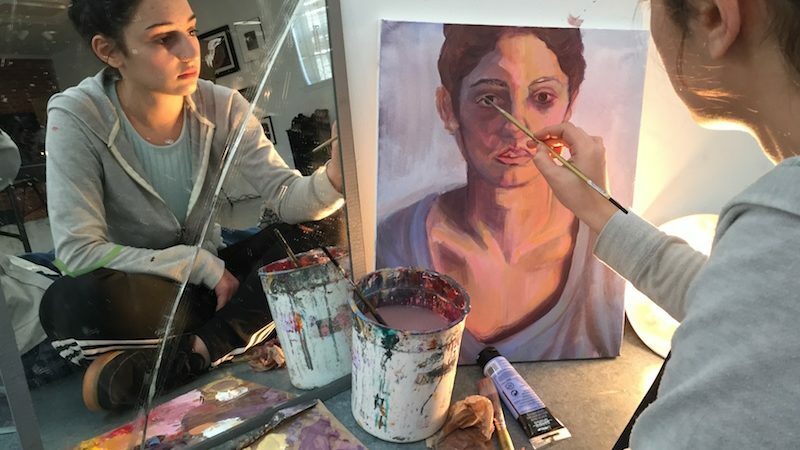 While programs may focus on mastering a particular art form — painting, sculpting, drawing, animation, filmmaking, or even preparing a college portfolio — the program’s overall success has been attributed to its focus on the individual student. The organization has a core staff of about ten full-time workers and only about six administrative positions, but employs between 40 and 50 teaching artists who conduct courses, teach after school programs in the city school district or at Hudson Valley libraries and community centers. Besides sharing technical expertise, these artists provide students with a glimpse of what it’s like to work at your craft. The program offers some students paid jobs so they don’t have to choose between art and working at an entry level job. It’s an opportunity not only to create, but to get paid while brushing up on work skills. The program offers help building college portfolios and starting resumes. While working with Forge Media, Art Effect’s filmmaking apprenticeship division, students can get practical experience making commercial films. Students are paid working on an actual set. Remaining profits are donated back to the program. One of the program’s young filmmakers recently won a student award at the Tribeca Film Festival for her film Santa Woman. Art Effect also organizes an international Reel Expressions Teen Film Festival. Students who want to study art in college need a portfolio. The Art Institute pre-college portfolio program for teens ages 14-19 helps students fine tune their portfolios, then offers a chance to engage with college reps on a Portfolio Day. According to Langdell, the response has been enthusiastic. Since 2000, program graduates have been offered over $45 million in merit-based scholarships to leading colleges, universities, and art schools. The Art Effect plans to extend arts programs throughout the Hudson Valley, especially in urban areas, so more children can achieve their personal best—whether that’s becoming a working artist or developing interpersonal skills.